Natural sea salt from the Mediterranean Sea in Europe. The Ibiza Salts are selected for their purity and beautiful crystal white appearance. 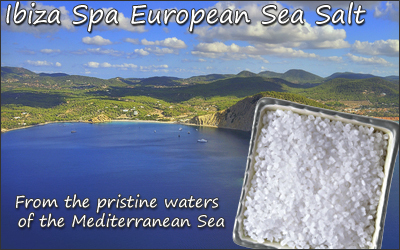 European solar sea salts come directly from the pristine waters of the Mediterranean Sea and are produced using ancient methods of solar evaporation. This region is free of pollution and has high evaporation rates, making it a very pure salt. Our European sea salt is low in moisture, clean and white and contains trace elements such as Iodine, Fluorine, Magnesium and Potassium. These raw salts are ideal for making bath salts, body scrubs, and a variety of other bath and body products. We have carefully selected the finest grade and purest European Sea Salt available for your bathing pleasure. Enjoy! Bath Salt - Add 4oz - 8oz per bath for a soothing & relaxing soak. For true muscle and skin therapy, try using 1lbs or more for a real sea therapy experience. Exfoliating Body Scrub - Choose fine grain and mix with natural oils to create a natural salt scrub. Popular oils are almond oil, grapeseed oil, sesame oil, and avocado oil. You can also add in a few drops of your favorite essential oils or scent.